Official Release: When passion for motor racing is the driving force and intense open-air pleasure the goal, the new MINI John Cooper Works Convertible takes the ideal line from the word go. 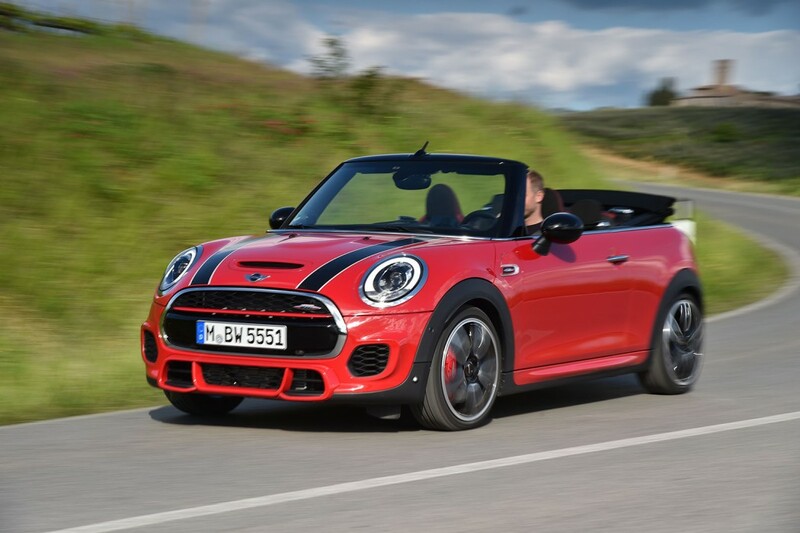 The second John Cooper Works model of the latest generation combines engine and suspension technology optimised for use on the race track with distinctive design and equipment features as well as the extensively refined qualities of the new MINI Convertible. John Cooper Works now launches the second top athlete of the new model generation; new MINI John Cooper Works Convertible invites racing fans to enjoy extreme driving fun in a particularly exclusive way; unique vehicle concept in the small car segment combining authentic racing feel with intense open-air enjoyment, complete with the premium quality and mature product substance of the new MINI generation. Thrilling performance properties and extrovert charisma; drive, suspension technology and aerodynamics developed on the basis of well-established racing expertise; distinctive design features in the unmistakable style of John Cooper Works and clearly differentiated from the new MINI Convertible. 2.0-litre 4-cylinder power unit developed exclusively for John Cooper Works models; current engine generation with MINI TwinPower Turbo Technology as the basis; fascinating performance characteristics and highly emotional sound development due to distinctive design of pistons, turbocharger and exhaust system; the most powerful engine in the MINI portfolio with 170 kW/231 hp; output increase of 15 kW/20 hp as compared to the predecessor model and 29 kW/39 hp as compared to the new MINI Cooper S Convertible: maximum torque: 320 Newton metres; 6-speed manual transmission as standard, 6-speed Steptronic sport transmission available as an option; combined EU fuel consumption: 6.5 l/100 km (automatic: 5.9 l/100 km, combined EU CO2 emissions: 152 g/km (138 g/km). Extremely sporty acceleration and elasticity figures; 0 – 100 km/h in 6.6 seconds (minus 0.3 seconds) with manual transmission and 6.5 seconds (minus 0.6 seconds) with Steptronic transmission, 80 – 120 km/h in 6.1 seconds (minus 0.7 seconds); top speed increased by 7 km/h to 242 km/h (automatic: 240 km/h). Power transmission to the front wheels; high-quality suspension technology with set-up geared perfectly to the vehicle concept and engine performance characteristics; standard trim includes Brembo sports brake system, 17-inch John Cooper Works light alloy wheels Track Spoke silver and speed-related Servotronic steering support; Dynamic Damper Control available as an option; Dynamic Stability Control (DSC) as standard with DTC (Dynamic Traction Control), EDLC (Electronic Differential Lock Control) and Performance Control. Powerfully expressive design with dynamically stretched silhouette, powerful surface shaping and optimised air routing in the style of John Cooper Works; large cooling air outlets in the front apron which also occupy the space provided for the parking lights and fog lamps in the MINI Convertible; distinctively designed side sills and rear apron; LED headlights with white turn indicators and LED rear lights as standard; radiator grille, side scuttles and tailgate with John Cooper Works logo; optional body finish in the variant Rebel Green exclusively available for John Cooper Works models. New textile top with fully electrically powered, especially low-noise operation for the first time; fully automatic opening and closing of the soft top at the press of a button in 18 seconds, also during travel at speeds up to 30 km/h; sliding roof function available at any road speed; optional MINI Yours top with integrated high-end Union Jack graphic. Vehicle dimensions, wheelbase and track width significantly larger than in predecessor model; optimised space on all four seats; rear seats with single-seat character and extended seat surface; luggage compartment capacity increased to 215 litres with the top closed and 160 litres with the top open; standard trim includes folding split backrest, enlarged through-loading facility and Easy Load function. High-quality interior with refined premium ambience, modern display and operating concept of the latest MINI generation and the sports car cockpit typical of John Cooper Works models; fully integrated rollover protection bars behind the rear seats; John Cooper Works sports seats in Dinamica/fabric Carbon Black with integrated headrests; John Cooper Works door sill cover strips; John Cooper Works leather steering wheel with multifunction buttons and shift paddles in conjunction with the 6-speed Steptronic sport transmission; John Cooper Works gearshift or selector lever; cockpit displays and central instrument surround in model-specific design; pedals and driver footrest in stainless steel. Highly rigid body structure with convertible-specific bracing elements for an agile driving response with maximum occupant protection; complete set of standard safety features with front airbags, head-thorax airbags integrated in the backrests, 3-point automatic belts on all seats, ISOFIX child seat mountings for the front passenger seat and at the rear, tyre pressure display and partially active engine compartment lid for optimum pedestrian protection; needs-based control of the restraint systems and rollover protection by means of centralised safety electronics. Standard trim includes fully automatic soft top operation, air conditioning, MINI Driving Modes, Radio MINI Boost with AUX-IN and USB socket, as well as Park Distance Control. Exclusive optional equipment and John Cooper Works tuning accessories; optional MINI Head-Up Display with John Cooper Works specific display content; MINI Driving Assistant; Parking Assistant; rear view camera; 2-zone automatic air conditioning with convertible mode; Always Open Timer with new display content; new wind deflector with reduced weight and simplified attachment; Comfort Access; rain sensor with automatic driving lights control: MINI Excitement Package including MINI Logo projection from the exterior mirror onto the ground in front of the door on the driver’s side; MINI navigation system and Wired equipment package including navigation system Professional with MINI Touch Controller; Bluetooth mobile phone preparation; exterior mirror caps in Chili Red; 18-inch John Cooper Works light alloy wheels CupSpoke 2-tone; John Cooper Works bonnet stripes as well as exterior and interior components from the John Cooper Works Pro design line.